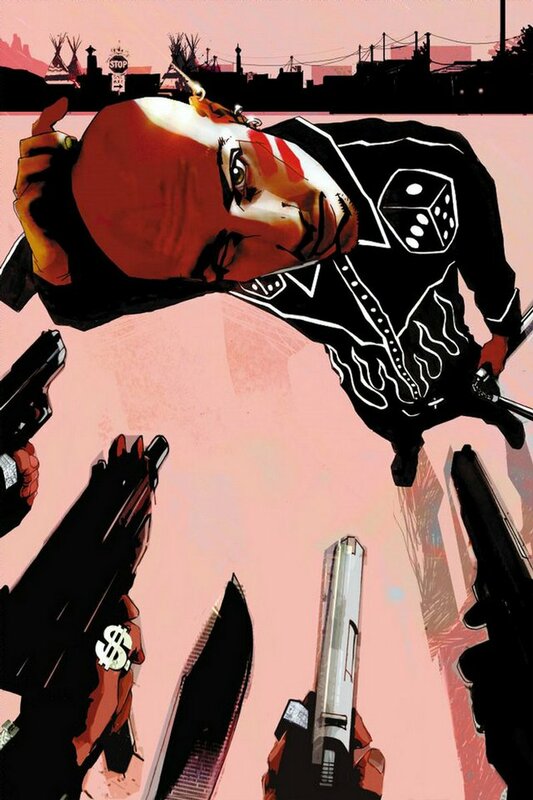 "The Sopranos on an Indian reservation"...that's what people are calling SCALPED, the new comic-book title from DC/Vertigo. With a script by Jason Aaron and art by R.M. Guera and Lee Loughridge, it's a story we haven't seen before. Apparently SCALPED is an ongoing monthly series, which would make it the first from a major publisher set on a modern rez. If so, it's a landmark in Native comics history and it deserves a serious look. The premise:Fifteen years ago, Dashiell 'Dash' Bad Horse ran away from a life of abject poverty and utter hopelessness on the Prairie Rose Indian Reservation in hopes of finding something better. Now, he's come back home to find nothing much has changed on 'The Rez'--short of a glimmering new casino, and a once-proud people overcome by drugs and organized crime. So is he back to set things right or just get a piece of the action?The attitude:Scalped is an intriguing inversion of the usual story archetype used to deal with Native Americans--instead of being the noble, oppressed-by-the-evil-white-man types that they are almost always portrayed as, here they are shown to be as flawed, coarse and just plain seedy as the rest of humanity. This is, as the solicits have said, essentially The Sopranos with Native Americans in the leading roles, and it's as bloody and unpleasant as you'd expect from that description. Don't read this if you're looking for a title that exemplifies the glorious, tragic nature of the fallen nations of America's native populations, because you certainly won't find it here. Foul language, violence, and the lure of cold, hard cash--it's enough to corrupt even the most righteous of hearts. Native Americans are people too, folks...and that also means they can easily be the bad guy. But can they also be the sort of bad guy you want to root for?The writing:It's a bloody, grubby, torturous crawl through the dank underbelly of crime on a Lakota reservation, with virtually all of the main characters being given an extremely gory introduction. Smeared over the story like warpaint is a fine coating of extremely coarse language, which again goes to show that Native Americans aren't always the noble, restrained sort, and perhaps have been infected by the ways of the white man more than they would like to admit. It's a surprisingly humanising touch that lends a real spark of vigour to the proceedings, as perpetually detached and calm characters don't exactly make for very interesting (or indeed realistic) reading.The artwork:R.M. Guera is a bit of a veteran artist in European graphic novels, but fairly unknown to the whole U.S. comicworld. And I have to say his art isn't pretty at all. It kicks you in the gut and draws you into the grim world of an Indian reservation. The art is unsettling as even the day scenes are bleak and grim. This isn't a neighbourhood where one would like to live. Guera's art isn't meant to put a smile on your face. His dark ink lines are thick, moody and irregular. There isn't one genuine smile on any of the Indian characters in this book. These people have twisted lives and nothing to be happy about. Colorist Lee Loughridge didn't have to pull out his whole color palette, because depressing colors is all he needed.The intent:Aaron: Hopefully most people understand that even with the advent of Indian Gaming, life on the rez ain't like living in a Las Vegas penthouse. The average income of Natives living on reservations is still less than half of the national average. Native unemployment is double the rest of the country. I'm not nearly pretentious enough to think I'm here to change people's perception of rez life though. SCALPED is a crime series at heart, after all. But I would like to give readers a gritty look at day-to-day life in the poorest region of the United States. Phil Hunn, ComixFan:[T]he more you read it, the more it grows on you, like a creeping bloodstain. Highly recommended.Martijn Form, Silver Bullet Comics:Too bad Vertigo doesn't do "Director's Cut" issues. I would have bought one without hesitation. So let's all buy this series and make this title a success because it deserves it.Mathan Erhardt, Machine Gun Funk:Summary: All in all, Scalped is an impressive debut. It's not flawless, but everyone involved really captures the grittiness of reality and transplants it on the page. This could turn out to be HBO's The Wire on an Indian Reservation. Ray Goldfield, Jinxworld:Probably the worst effort I've seen out of Vertigo in some time. Ugly, hard to follow art; a story that seemed mostly to be driven by gratuitous violence and foul language, and a rather simplistic agenda that doesn't even begin to scratch the surface of Native American culture. The Other Side had an interesting idea and some big problems. This one doesn't even have that. 2/10TheManWithoutFear, Jinxworld:I'm debating. Rob's review: I'm all in favor of having a monthly series set on an Indian reservation. But SCALPED isn't that series. For starters, I'm pretty sure no reservation is as bad as Prairie Rose (read Pine Ridge). Sure, many reservations have gangs, drugs, and violence, but they also have schools, clinics, and businesses. More to the point, they have traditions, beliefs, and ceremonies--none of which are evident in SCALPED. Except for a few throwaway Lakota words, there's no evidence of Indian culture here. This story could be set in any ghetto or slum. Red Crow, the tribal boss ("leader" isn't the right word), describes himself as "the president of the Oglala tribal council...as well as sheriff of the tribal police force, chairman of the Prairie Rose planning committee, treasurer of the highway safety program...and managing director of this here brand-spankin' new casino." One or two tribes may have a "Godfather" like Red Crow in charge, but the other 560 federally recognized tribes don't. Writer Aaron has taken the worst possible scenario and presented it as the norm. How evil is Red Crow? When we first meet him, there's a corpse lying in a pool of blood next to his desk. Not only does Red Crow leave bodies lying about, he's killed and scalped the man himself. Red Crow claims he's one of the few who still remembers how to scalp people. If there are more than a handful of Indians who still know this "art," I'd be surprised. Out of millions of Indians, the odds that one of these few people would rise to the position of tribal chief are vanishingly small. It's clear what Aaron's inspiration is for this ultra-negative portrayal of life on the rez: the horrible situation at Pine Ridge in the '70s, when rabble-rousing activists fought a corrupt tribal government. This is the conflict that ended in Wounded Knee and put Leonard Peltier in prison for life. Trouble is, that was 30 years ago. Tribal governments are much cleaner now because anyone with a cellphone, copy machine, or website can expose their flaws. Indians do use technology, believe it or not, although you wouldn't knows it from SCALPED. This series reads as if it was set in the 1970s--as if Aaron wanted to do a Quentin Tarantino version of Thunderheart. Do tribes that pursue gaming have problems? Sure, but no more so than any other organization. These days, Indian gaming is on everyone's radar screen. You can't even mention opening a casino without getting thousands of people involved on every side of the issue. Moreover, casinos aren't a major source of crime. Every Indian casino gets approved and regulated by multiple levels of government. The most recent gaming scandals involved lobbying in Washington, not crime on the rez. SCALPED is yet another version of the age-old tale of good Indians vs. bad Indians. In James Fenimore Cooper's The Last of the Mohicans, it was the noble Chingachgook and Uncas agasint the evil Magua and his minions. In Karl May's Winnetou, it was the noble Winnetou against the evil Tangua and his minions. The message of these works is the same overall. The many bad Indians outweigh the few good Indians. Thus Indians have gotten what they deserve. They're awash in poverty, crime, and substance abuse because they're corrupt, degraded, and immoral. The exceptions to the rule, such as Uncas and Winnetou, only prove the rule. The proposed casino is called the Crazy Horse Casino. Perhaps Aaron is making a statement about Red Crow's immorality, because few tribes would dishonor the name of the revered Lakota war chief that way. Maybe one tribe would be insensitive enough to choose this name, but the vast majority wouldn't. Again, Aaron has taken what would be an exceptional case and presented it as if it were the norm. I don't give Aaron much credit for the crude language and casual violence in his script. The Sopranos may talk and act this way, but they're literally a den of thieves. A tribe has much more variety than that; it has artists and teachers, caregivers and veterans, as well as criminal elements. This isn't a honest look at life on the rez, as some reviewers have claimed. It's dishonest because it's far more dark and dangerous than the reality. Nor do I give Guera and Loughridge much credit for the moody art. The characters look like generic minorities and their skin tones range from sienna to olive to ochre. I wasn't sure if they were blacks, Hispanics, or Indians until the middle of the story. 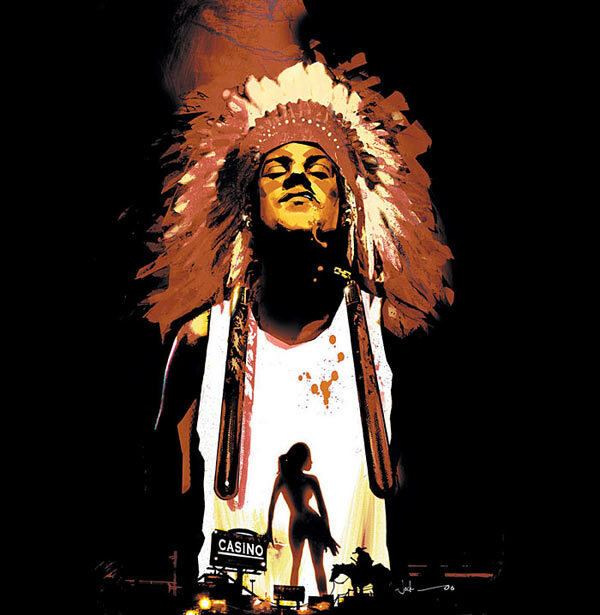 In short, SCALPED is reasonably entertaining as a Sopranos-style crime drama. As a genuine look at reservation life, it's a grotesque distortion of reality--almost a pure fiction. I'll venture to say that no reservation, not even Pine Ridge in the '70s, was ever this bad. The reviewers are kidding themselves if they think people still think of Indians as inscrutable New Age mystics. These days people are more likely to think of Indians as corrupt casino owners who bribe politicians and run roughshod over neighbors. The depiction of Red Crow tells them that, yes, that's just how Indians are. The readers' likely conclusion is: Screw those greedy Indians. Writer Aaron is kidding himself if he thinks people will learn about Indians from SCALPED. What they'll learn is that Indians are criminals, thugs, and lowlifes. In other words, that they're just as savage and uncivilized as they ever were. What a charming message that is. Hey, I read your review of SCALPED #1 and just wanted to respond to a few of your points. "Writer Aaron has taken the worst possible scenario and presented it as the norm." I don't think it's fair to say that I'm presenting the world of SCALPED as the norm for all modern day Native Americans, anymore than the Sopranos represents the norm for Italian Americans who live in New Jersey. SCALPED is a crime series, so it's obviously going to focus on the most sensational and unseemly elements of reservation life. Yes, the situation on my fictional Prairie Rose rez is worse than what you'd find on any single real-life rez. But I think we'd agree that drugs, alcoholism, corruption, organized crime, violence, suicide, fetal alcohol syndrome and loss of cultural identity are all issues being faced by Native Americans as a whole. "Except for a few throwaway Lakota words, there's no evidence of Indian culture here. This story could be set in any ghetto or slum." Native American culture and history will most definitely play a large part in the series. Again, I think it's unfair that you're looking at only the first issue and making sweeping assumptions about an ongoing series that I'd love to see run for at least 80 issues. The first issue, and the first arc as a whole, are certianly more action oriented, I admit, but overall I see this as much more of a character drama than an action driven series. And Lakota history and culture will be vital tools in defining many of the characters in SCALPED. "I don't give Aaron much credit for the crude language and casual violence in his script. The Sopranos may talk and act this way, but they're literally a den of thieves. A tribe has much more variety than that; it has artists and teachers, caregivers and veterans, as well as criminal elements." Again, this is a crime series, so it's obviously going to focus on criminal elements. But I do understand that any tribe has great diversity, and we will show that in SCALPED. Eventhough I'm writing a fictionalized crime series, I fully understand the responsibility I'm taking by setting my book on an Indian reservation. I've dealt with the same sort of issues on my other series, THE OTHER SIDE, which involves the Vietnam War. SCALPED will always be a crime story at heart, but at the same time, I promise I will show more elements of rez life than just the most sordid. "The reviewers are kidding themselves if they think people still think of Indians as inscrutable New Age mystics. These days people are more likely to think of Indians as corrupt casino owners who bribe politicians and run roughshod over neighbors. The depiction of Red Crow tells them that, yes, that's just how Indians are. The readers' likely conclusion is: Screw those greedy Indians." That's not at all how I feel. 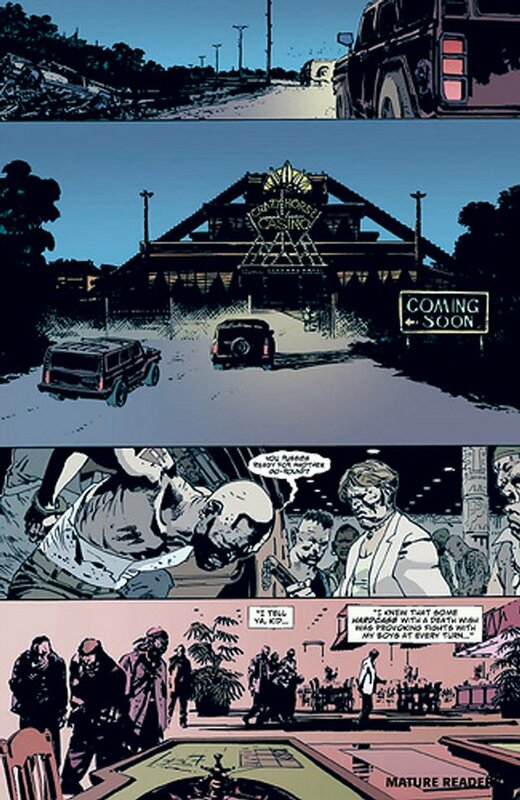 And if someone reads the first five issues of SCALPED and comes away thinking that Red Crow is simply a greedy, corrupt, unsympathetic casino boss, than I've failed as a writer. I don't want any of my characters to be that simple and predictable. If anything, I think Red Crow will eventually be the most sympathetic of all the characters in SCALPED. "Writer Aaron is kidding himself if he thinks people will learn about Indians from SCALPED. What they'll learn is that Indians are killers, criminals, thugs, and lowlifes. In other words, that they're just as savage and uncivilized as they ever were. What a charming message that is." I'm not writing SCALPED with any sort of agenda in mind, and I'm not nearly pretentious enough to think that I'm here to educate the country on the state of Native life. My objective with SCALPED is to craft interesting characters and to tell a good story, and I've been working really hard for months now to do just that. I fully understand that SCALPED won't be everyone's cup of tea. But I just wish that you'd give the book a little more of a chance before totally writing it off. SCALPED #1 doesn't say anything, as far as I can recall, about "Prairie Rose" being the worst or even an exceptional case. Readers who don't know anything about rez life may infer that this is a typical situation. That's especially true since they've heard many stories about corrupt, greedy casino owners in the mainstream media. This comic confirms everything they think is true. Also, you've said in interviews that you want people to learn about conditions in Indian Country, or words to that effect. That again implies the situation in Prairie Rose is typical or representative. No, it isn't. I understand that many reservations are dysfunctional. If the depiction of Prairie Rose had been negative but fair (what I consider fair), I wouldn't have criticized it for that. I didn't criticize the movie Skins because it was negative, even though it portrayed the dark side of Lakota life. I thought it showed the right amount of negativity for a place like Pine Ridge. I also get the comparison with The Sopranos, a show I've watched and enjoyed. But The Sopranos shows a wide range of Italian characters, not just bad ones. Moreover, the whole point of the show is the angel and devil battling for Tony Soprano's soul. Unlike Boss Red Crow, few of the Sopranos characters are pure evil. Almost all are complex people who love their families, honor their mothers and fathers, go to church and PTA meetings, donate to charities, etc. So far, SCALPED seems more like Scarface, Pulp Fiction, or The Godfather than The Sopranos. It's a more extreme look at Indians than The Sopranos was at Italians. Only about half the Sopranos episodes featured mob killings or violence, while SCALPED #1 was drenched in these things. We'll see if that continues. As you can see, they don't take these one-sided portrayals lightly. I'd say they've had it with this kind of bias. Yet SCALPED is going to be a crime series for 80-plus issues? If you ask me, any series that portrays an ongoing crime conflux on an Indian reservation is stereotypical. It's not portraying the reality of Indian life anywhere in the United States. Sure, many reservations have crime and drug problems, but these aren't the predominant themes anywhere. And again, I doubt any reservation has a leader as nasty as Red Crow. SCALPED isn't the "most sensational" example of rez life; it's worse than that. I realize things may get better in future issues. As a critic, I could only review the issue at hand. I'll stick with SCALPED through the first story arc, at least. If I see signs of improvement, I'll say so. P.S. I see you've posted several positive reviews on your blog. I'd be curious to see how many positive reviews you've gotten from Natives. You know, the people who actually know the reality of Indian Country. "I can understand your criticism that there is nothing ennobling about his story, but do all stories dealing with native peoples need to be ennobling? "I don't think we should ever treat some segment of the population as "off limits" ... just because we're afraid [of] trying to depict something stylized but realistic." Erhardt: "Basically the first issue isn't always a great gauge for anything." "[The Native soldier] was so enraged and filled with grief that he pulled the woman's body from the ground and scalped the hair from the back of her head."